Can Montessori Students Compete with "Conventional" Standards? Recent studies comparing Montessori classes with Conventional classes clearly demonstrate that Montessori children are more advanced than their peers. (Montessori: The Science Behind the Genius, by Dr. Angeline Lillard). In Montessori, we do not give tests as part of our curriculum, but we do offer an annual, standardized, skills-based test (Iowa Test of Basic Skills) to children 3rd grade and up. Despite not taking a single test throughout the year, Riverstone students' standardized test scores not only meet standards ("meets standards" scores are most commonly published by other private/public schools), but the majority of Riverstone students exceed these standards by several grade levels. Parents with children struggling in conventional public or private schools bring their student to Riverstone Montessori to excel beyond conventional expectations. Likewise, academically advanced students transfer to Riverstone because they are not challenged in their conventional accelerated or magnet program to meet their full potential. 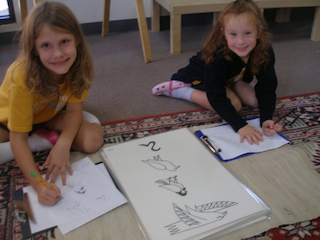 Students who begin their education in an AMI Montessori program and continue through Elementary can develop the skills to independently function in any other educational environment. AMI Montessori students are given the skills to prepare, research and plan so they are capable of meeting new challenges in school and life. Dr. Montessori believed it was more important for a child to "learn how to learn," than it was to simply teach them rote information. Students who graduate from an AMI Montessori Elementary or Adolescent Program program can easily transition to a traditional school environment. Having been given the skills to plan and prepare their own education, they are more capable of adapting to the challenges presented by the factory-model programs of most public and private schools than their peers who have always been in these programs.